Would make a great christmas present. I just picked one up. 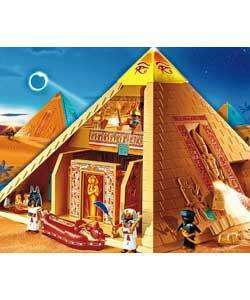 The Playmobil Pyramid has an amulet key which unlocks the 6 hidden chambers including trap stairs, scorpion trap, secret chamber, burial chamber, trap door with slide and a secret treasure hiding place. I thought this was a great deal! Paid £79.99 last xmas, my lad loves it. Expensive, but all playmobile stuff is - voted hot. Thankyou!! I've just reserved it for my son for Christmas!! Pyramid selling should be banned. Got this yesterday also, looks a great buy for the money. this is still on offer - lets give this some heat for xmas! And yes it is HUGE! Deal posting newbie! This is stormydat first deal post. Help out by leaving a posting tip or just to show your appreciation for their contribution.